Digital Manufacturing (DM) is one of the commonly used manufacturing technologies which is centered around a computer system. A machine is able to read a CAD (computer aided design) file in order to make it in a few minutes. Within the same process, it is possible to prototype, produce and fabricate molds and patterns to aid production . The name comes from the rise of computer systems in manufacturing plants. Today’s manufacturing uses the computer tools in design (or solid modeling), simulation, and analysis of almost all steps in order to increase the efficiency of manufacturing processes. In this sense, DM shares the common goals of additive manufacturing (AM), computer numerical control (CNC), computer-integrated manufacturing (CIM), flexible manufacturing, lean manufacturing, and design for manufacturability (DFM) . 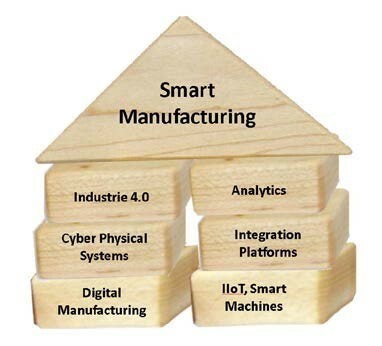 However, Project MANEUVER does not cover the concept of Smart Manufacturing (SM) since SM is more focused on data and information management and control, and DM is a part of the whole SM concept . Figure 1shows a representation of today’s advancing manufacturing environment.One important part of the current project is to provide an easy-to-learn and easy-to-use design and modeling environment to generate 3D solid models for use in DM and VR applications.